HomeMOVIE & TVStar Wars Directors FIRED! ?, Netflix Announces Interactive TV Shows! trollface quest TV shows craaaazy game!!! Star Wars Directors FIRED! ?, Netflix Announces Interactive TV Shows! Стрим игры “Troll Quest TV Shows”. 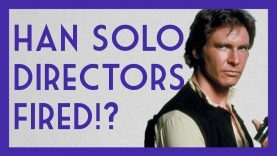 Phil Lord and Chris Miller have stepped down from the Han Solo movie, 3 weeks before production wrapped, what exactly is going on?